She’s played the musically inclined “Kelsi Nielsen” in the phenomenon Disney Channel Original “High School Musical” trilogy and in her latest project, portrayed the role of “Emily Smith-Dungy” : a determined, competitive jump-roper in the movie “Family Weekend”; but whatever role the multi-talented actress Olesya Rulin takes on, it’s clear that her grace and charm on the big and small screen makes her a fan-favorite! Actress Olesya Rulin’s talent is always a pleasure to watch and it keeps her fans anticipating and wanting a lot more! Olesya Rulin did a magnificent job (but that’s not a surprise!) in her lead role in the terrific and heartfelt movie, “Family Weekend”. 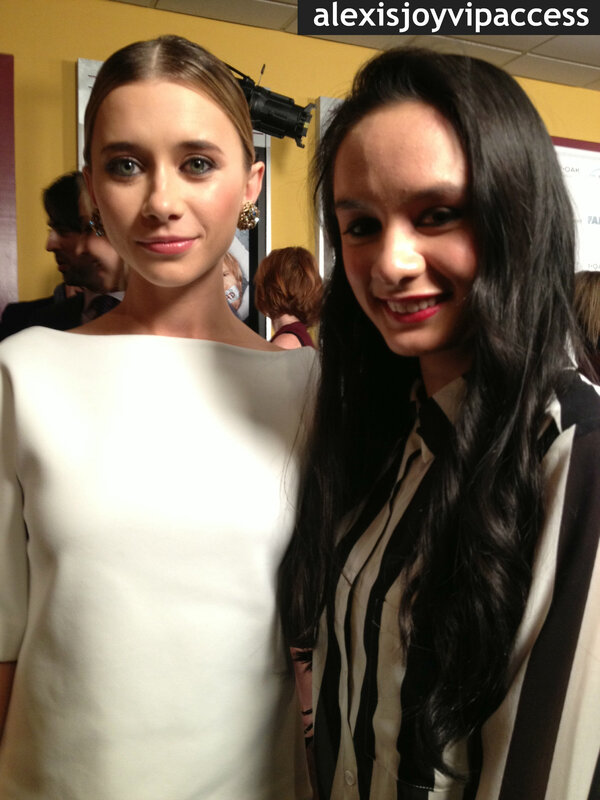 I, Alexisjoyvipaccess chatted with the marvelous Olesya Rulin on the red carpet of the fantastic “Family Weekend” NYC special screening. Olesya Rulin dished about her role in the movie, the amount of training she went through to prepare for this movie, and more! Check out my VIPAccessEXCLUSIVE interview with the wonderful Olesya Rulin below along with some VIPAccessEXCLUSIVE pictures I took of Olesya Rulin and the “Family Weekend” cast on the red carpet of the event! Thanks for the amazing interview, Olesya! **Since the video may be a little difficult to hear, you can also read my VIPAccessEXCLUSIVE interview with the lovely Olesya Rulin below! Alexisjoyvipaccess: You look amazing, absolutely stunning as always! Olesya Rulin: Thank you! Alexisjoyvipaccess: So can you tell us about your starring role in the movie, “Family Weekend”? Olesya Rulin: Yeah! I play Emily Dungy and she is a competitive jump-roper, which is a sport; and she’s so intense in her love and passion for jumping and her family doesn’t come to her big state championship; so she decides to take drastic measures, tie them up and teach my parents to be better parents. It’s an intense, dark comedy full of laughter and a lot of heartfelt moments! Alexisjoyvipaccess: Excellent! So do you have a specific favorite scene from the movie? Olesya Rulin: Ooh! You know what, there was one of the scenes I actually did not like shooting- is one of my favorite scenes in the film! There’s no dialogue, it’s just a close-up of me jump-roping and they pull out and we’re in front of this beautiful frozen lake and I’m on a dock practicing; and it was so cold that day that like the camera guy had a blanket on him, everyone’s in parkas and I’m standing there like half naked in this little jumping suit; but artistically and when it comes to the movie and the photography was beautiful! Alexisjoyvipaccess: Before this film, did you need any training with jump-roping or you were pretty good yourself? Alexisjoyvipaccess: So lastly, if you could bring out one message to all your fans, what message would that be? Olesya Rulin: Wow! This question is so deep, I’m always like- there’s so many things I would tell you, I guess- thank you so much for supporting me through all of these years! You guys have changed my life and shifted my life in ways that I can’t explain so thank you, thank you. I am enternally grateful! And also that, I guess what I’ve learned from my career is failure is a wonderful thing. It teaches you lessons and it opens doors you never thought would open and kind of embrace it and don’t take it so hard! Be like, “Okay, well that happened- Next!” and move on. It helps me the most! Alexisjoyvipaccess: Well I couldn’t agree with you any more! And I will definitely keep that in mind whenever something happens so thank you so much for talking with me and I look forward to seeing you on the big screen tonight! Olesya Rulin: You’re welcome! Thank you! Thank you so much!